Darren, Dave & Dion are the guides who are ﻿Untamed Fly Fishing.﻿ We are all locals, and know the rivers in North East Victoria intimately. Let us take you to some of our favourite fishing spots which just happen to be in some of the most stunningly beautiful, yet ruggedly wild country in Australia. We have endless trip options available and cater for all levels of experience. Choose from single day beginner tuition, to multi day camping trips. We also offer RiverQuesting - ultralight backpacking trips for the more adventurous. Southland New Zealand is my favourite holiday destination to chase a trout. Big trout, challenging conditions, amazing scenery - just an amazing place. 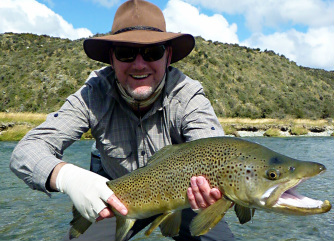 If you are visiting Southland New Zealand you NEED to fish with Chris! To help, we've developed some packaged outfits to best suit each of the locations above. These can be purchased either as a package, or as single items depending on your needs. Click on the links below to be taken to that locations outfit option.